Local businesses — support the Hometown Festival and publicize your company at the same time by being one of our sponsors! All proceeds go toward making the Hometown Festival the best day of the year in Round Hill! Opportunities range from a $100 line sponsor on the T-shirts to a $1,000 amusements sponsor. All sponsors will be thanked on the Festival Facebook page and on this website, and depending on the level of sponsorship, your logo will appear on the T-shirts or on a sign or banner displayed prominently at the Festival. For more information on sponsorship levels, see our flier or contact Allison Cremona at gidgetsbeautybox@gmail.com. Once sponsorship is confirmed, payment may be made at the Round Hill Town Office or through PayPal via our sponsorships page. This is your chance to take center stage and strut your stuff — the Round Hill Hometown Festival’s Open Mic session! From 3-5 p.m. the stage will open for poetry, drama, dance, song, magic and more. Register online through the Round Hill Arts Center at www.roundhillartscenter.org. 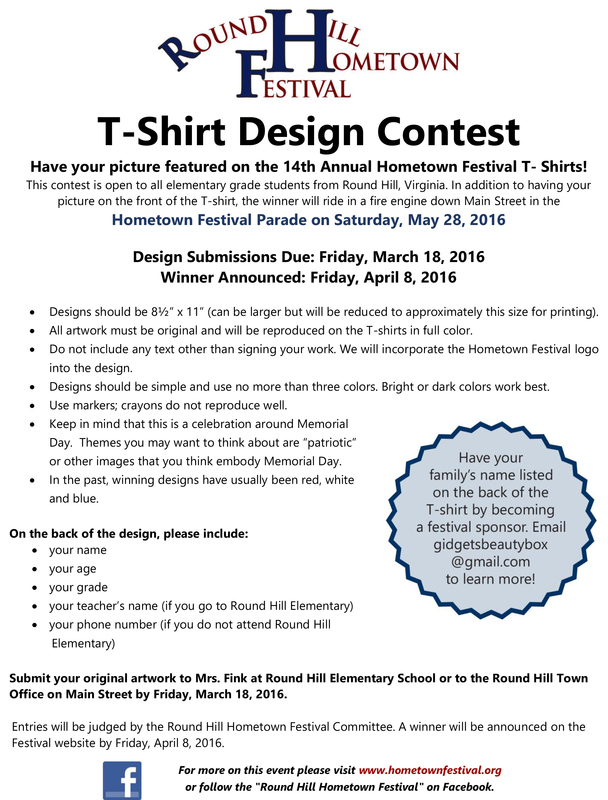 A friendly reminder that the deadline for the Hometown Festival T-shirt contest is Friday at 3 p.m. Please turn submissions in to Mrs. Fink at Round Hill Elementary School or to the Town Office on Main Street. For full contest details, see the contest flier. Gentlemen (and ladies), start your power tools! Whether your car is from a kit or completely homemade, it’s time to start building! Car specifications, race rules and links to websites with helpful tips are now available on our Downhill Derby page. Check it out! This year’s T-shirt design contest is underway! Kids, this is your chance to make your mark on the 14th annual Hometown Festival! Grab your best markers and some paper and show us your ideas for what the Hometown Festival is all about! The contest is open to all elementary school aged children who live in Round Hill (as defined by having a 20141 or 20142 zip code), or any student at Round Hill Elementary School. Submissions must be turned in to the Round Hill Town office or to Mrs. Fink at Round Hill Elementary School no later than 3 p.m. on Friday, March 18. The winner will be announced by Friday, April 8. The winning design will be used on T-shirts for the Festival 5k as well as for the general Festival Ts. The winner is also invited to ride on a Round Hill fire truck during the Festival parade on May 28. For more details, see the contest flier. Happy drawing! The Hometown Festival committee is looking for two volunteers to help coordinate the pie-eating contest. If you are interested in helping out, comment below or email info@hometownfestival.org. It’s the sweetest job of the day!